Hot tip for setting up a beamsplitter rig that utilizes digital cameras that have rolling shutters: make sure the cameras are positioned such that the refresh is synchronized to "paint" the scene the same direction in each eye. This tip seems kind of obvious from a technical standpoint but in application, apparently, not a lot of people have thought of this, so that's why I'm posting it. I just reviewed some SI2K footage from a beamsplitter where the cameras refreshed in opposite directions and the shots had reasonably disturbing artifacts (for obvious reasons) during active scenes. This would apply to RED and several other cameras, as well, and is more or less unfixable in post. 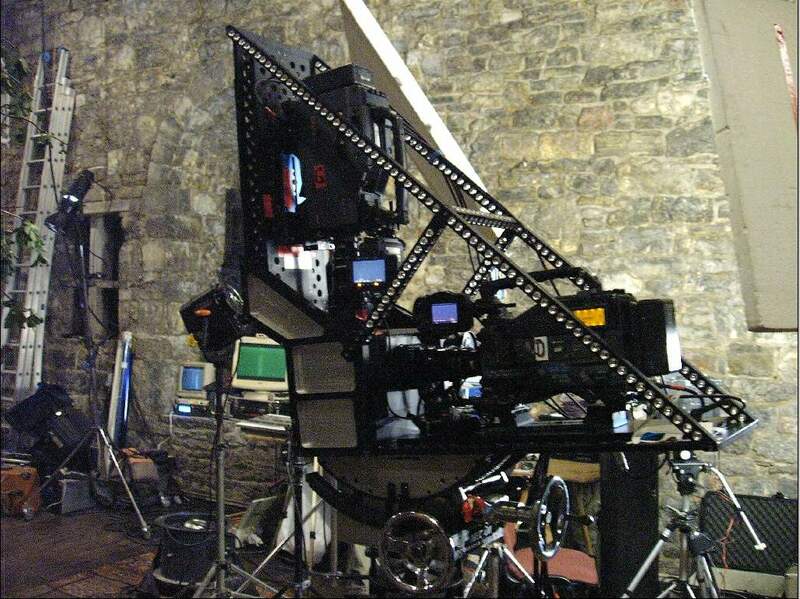 >>Hot tip for setting up a beamsplitter rig that utilizes digital cameras that have rolling shutters: make sure >>the cameras are positioned such that the refresh is synchronized to "paint" the scene the same direction >>in each eye. Now the upper camera image will not be upside down, however, it will be mirrored left-right. This is less dramatic as the left right scanning of the cameras is so much faster than the up-down scanning, so time delays, and hence the time errors will be much shorter. Putting the second camera under the main camera instead of above it also yields the same result. See http://www.kommer.com/devilsm.htm for an example. To scan exactly in sync, both up-down and left-right, one would need - cameras that take entire progressive frames and only scan them afterwards (like several progressive CCD cameras can do), or - cameras in which the scanning direction can be reversed (any one knows about an example here? - or shooting side-by-side, avoiding the mirror. This is an issue we have also been advising a lot of people on. Footage shot with the rolling shutters in opposite directions is in our opinion pretty much unusable with any movement beyond a snail's pace. From our experience this is the case with SI-2Ks and also with EX3s. Luckily the SI-2K mini is very easy to mount the other way up. I'd be interested to hear how bad it is on Reds as I hear their read-reset time is faster but I would not advise anyone to shoot in this way if at all possible. It's an interesting problem as it's one of those 3D image issues that many people don't pick up on. I've seen a lot of footage shot with this problem shown at major conferences and know of two features in currently in production that will have this issue throughout (we have obviously strongly advised them to address it). People often dismiss it, as to an non-expert eye, some footage shot with this problem can look ok, with any slight disturbance just put down to 3D viewing in general. - The type and speed of movement in the scene (or by the camera). Horizontal movement causes parallax shifts, in effect warping any moving object in 3D space. Vertical movement causes vertical alignment issues which will lead to 3D image break-up and/or eye-strain. As Eric mentioned, neither is something you want to be trying to fix in post. - The size of display. As with most 3D problems, the larger display the more the problem will be apparent. As part of our training course material we have shot examples to educate and convince people how much of an issue it is and how to recognise footage shot with it when doing post. Like several other 3D image problems, I think the best way to demonstrate this is to show the problem footage directly alongside the same scene shot without the problem in question. This convinces people that whilst they may think the problem footage looks ok to them, the non-problem footage is so much better and easier on the eye. >>This tip seems kind of obvious from a technical standpoint but in application, apparently, not a lot of >>people have thought of this, so that's why I'm posting it. Good job Eric! Temporal artifacts in 3D live action capture can be a challenge, when the whole picture is not considered. I have been designing BS3D rigs since 1996 using the optical fold you have described. Another plus for this fold is both images share the same north/south delineation. Now that you have let the cat out of the bag, I wonder if some of the rig manufacturers will have a recall, and incorporate this technique? >>Now that you have let the cat out of the bag, I wonder if some of the rig manufacturers will have a recall, >>and incorporate this technique? Fortunately, some cameras have mount points on both the top and bottom. But it does seem kind of silly to build a rig for digital cameras that has this inherent flaw. It is a good thing they are inexpensive. Thank you Eric for outing the cat. I was sworn secrecy about this trick that very few stereographers accepted to talk about. On show floors, I would always comment on the orientation of the cameras when it was set appropriately Many a BS3D rig designer would only answer an enigmatic "hum", checking over their shoulder if someone was taping the scene. Until know it used to be some sort of secret passcode between experimented stereographers. Like a recognition sign for members of a secret society. At least, it's now public and I'll be allowed to include it in my future presentations. Pixel Mate, Brotherhood of the coast. Or if some cameras can be set to integrate and read off in reverse order, if physical inversion isn't practical? It presumably shouldn't matter much one direction or the other unless there's also a mechanical shutter, but may be firmware, and not easily changed. This is an obvious problem and it is quite odd that multiple manufacturers have gone to great lengths paying attention to details in designing their rigs, but missing this completely. 21st Century 3D's recently released BX-2 has already addressed the issue. >>21st Century 3D's recently released BX-2 has already addressed the issue. Looking at those pics, first thought was that modular Epic might help address some of those weight distribution issues. But SI-2K already could. To Red monitors - how remotable will the Epic/Scarlet heads be, and will that modularity be doable soonish after release? >>"What's all this talk about rolling udders?.....Never mind!" Anyway, add to this another little issue with lateral motion in single projector triple flashing 144hz: beware the collapsing stereoscopic effect! So to recap: rolling shutters need to be scan oriented the same direction, and THEN for fun you need to anticipate how the finished product will be presented. I've created stereo using dual projectors only to discover that seeing it projected with common 3-D theater projection (RealD/Dolby) flattens out certain lateral motion. Are we all hip to this "gotcha" too? I've seen a paper, which will be presented in a few days during Siggraph 2009, that among other things (it's stabilization centered basically), looks like brings a solution to fix rolling shutter artifacts and IMHO could be worth checking it out. I am sure there are other things out, but this is a very clear example of roller shutter issues and a very clear solution to it. http://www.youtube.com/v/3TlCGh5Pc90 - the reference to rolling shutter is on 3:18 if you don't have much time. >> I've created stereo using dual projectors only to discover that seeing it projected with common 3-D theater >>projection (RealD/Dolby) flattens out certain lateral motion. Correct, but it also works *for* you in certain situations. I can't completely remember which eye frame is presented first, but (for the sake of discussion) if it's the left eye, then scene movement from left to right (camera moving, not panning, to the left) magnifies stereo cues and scene movement from right to left (camera moving right) subtracts stereo cues, even to the point of making the scene appear pseudo in extreme cases. Lenny Lipton could clarify more of how this specifically applies to Real-D, but it's a known problem (feature?) with any display system that alternates L/R eyes, like shutter glasses or any of the current digital cinema solutions. Technically, a 2D source shot correctly and presented with an alternating 3D display system would appear to have stereoscopic depth. Also interesting is the dark lens of most two-color anaglyph solutions induces an amount of pulfrich effect, so lateral movement creates and/or destroys stereoscopic cues there as well. This is especially noticeable with Colorcode.